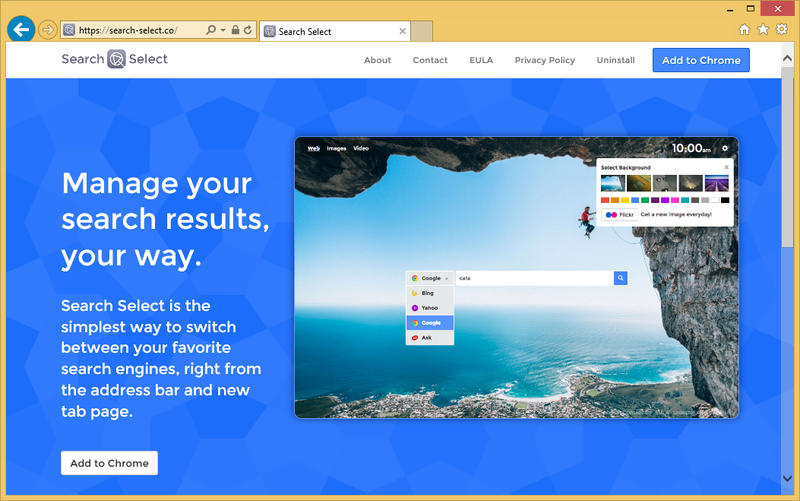 Search-select.co is a deceptive search tool promoted by Search Select, which is an application that promises to improve the web browsing experience. If you install this application on your computer, or it somehow finds a way to your system, it will immediately start redirecting you to Search-select.co. Actually, your homepage, default search engine, and the New Tab page will be replaced by Search-select.co too, so you will not escape from it. Search-select.co does not look like a bad web page, so many users do not even understand that they are sitting on a bomb. Despite the fact that Search-select.co looks like a legitimate website, specialists have found that it is not trustworthy at all. We will try to briefly explain to you why it is so. We will also help you to remove Search-select.co from all your browsers, including Internet Explorer, Google Chrome, and Mozilla Firefox. Even though Search-select.co seems to be a good website, it would be best to delete Search-select.co from browsers because it significantly diminishes the web browsing experience instead of improving it. It has been found that this web page might even present users with all kinds of advertisements leading to corrupted web pages. Another disturbing fact about it is that it monitors browsing activity and collects various details about a user’s behavior on the web. According to specialists, it might gather your IP address, web pages visited, search queries, pages viewed, and other data. At first, it might seem that these details are unimportant, but you will definitely agree with us that it is dangerous to keep it when you find out that all this collected information is going to be shared with cooperating third parties. In other words, keeping and using Search-select.co on browsers might lead to serious privacy issues. What you can do to help yourself is to uninstall Search-select.co from all your browsers right now. If you find it difficult to implement the Search-select.co removal alone, scroll down and start reading the last paragraph. Where does Search-select.co come from? If you cannot remember setting Search-select.co yourself as your homepage, search engine, or New Tab URL, it must have entered your computer together with the extension Search Select. It has its own official website, but you can also download it from a third-party website. If you are sure that you have not downloaded it yourself, it is very likely that it has entered your computer using the deceptive method called bundling. This infection is not unique in this sense because there are hundreds of similar threats that act the same. To protect your compute from future dangers, install a legitimate anti-virus/anti-malware tool on your computer and be cautious yourself all the time. How can I remove Search-select.co from my browsers? You can delete Search-select.co from all your browsers by resetting them all one by one; however, if you find this impossible to do alone, you should use a legitimate antimalware scanner. An automatic tool will quickly remove Search-select.co from your browsers, and you will simply have to launch it. A good tool will not only implement the Search-select.co removal, but will also find and eliminate other threats you might have on your PC.